For the last week of the Warm Fuzzies Blogfest, we are posting about what makes writing worth it. Why do we write, when a lot of times we have to go back and redo everything or get critique from others of how not good our writing is! For me, I write because it's just a part of who I am. 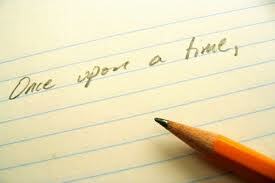 I've been scribbling stories since I was little--since before I could even write discernible letters! I would doodle and scribble on the bottom of a page and draw a picture above it, then walk around showing it to my family and telling them what my "story" was. I used to closet away in my mom's room with the old-school computer in there and write. Stories about witches, about roller skating, whatever. So my answer? I Write Becuase I Am. I exist, and writing is in my bones, and I have stories crawling along my brain, waiting to be told. I write because it's therapeutic for me, and because it's just plain fun. And I write because I would love to walk into Barnes and Noble one day and see my book on a shelf. I pull on the green, tissue paper and open the jewelry-sized box to find a cheap mood ring with a peace sign in the center. “Let me see,” Chravis says. He ignores Bailey’s smile and the fact that he bumped her mid-reach. I pull the ring off and hand it to him. Bailey leans closer to him than is necessary, but he doesn’t move away. I look at the tiny card and snort. “You are happy, romantic, or passionate,” I answer with a snigger. Immediately, both his and Bailey’s cheeks flush the same color of crimson. Bailey and Chravis? Really? That’s definitely unexpected, considering how she pronounced herself on the We Hate Boys side and I never thought there was any hope for Chravis at all. But they just stare at each other. “Here, let me see it again.” I pull the ring off the tip of Chravis’ fat pinky. He doesn’t even notice that I touch his hand. I slip the ring back on. Slowly the colors muddle and land on black. My brows crease. I’m not very stressed. I’ve actually been having a great time until I put the stupid mood ring on. In fact, it’s stressing me that the ring says I’m very stressed! I think I’ll let the ring determine what mood the garbage is in when I get home. @Kate and @Karen-I'm right there with you guys! @Cassie-I actually forgot to tag on my blurb and added it after your first comment. Thanks for stopping back! "I have stories crawling along my brain, waiting to be told." So true! I love that last line, hilarious! I loved the 'stories crawling about in my brain' line too! Love that scene, love the last line. I make jewelry and I actually have color changing beads I use to make moods rings. Haha...that last line got me good. I loved it!! Your MC has a great internal voice. Eeeeee!!!!! I've read this whole story and LOVED it!!!! Yay, thanks everybody!! :D Patricia, that's so cool that you made mood rings! And Morgan, you're an awesome beta pal!! Oh those mood rings! Mine always read black half the year because I live in a cold climate and my appendages are always freezing. Keep writing that good stuff! Haha! I love it! Mood rings are always such a laugh, but that last line sealed the deal. Brilliant! Lovely post! Really loved the scene you shared as well. Great job. Your blog looks AWESOME!!! Yay!